Book Blurb (from Goodreads): On March 1, 1940, Adolf Hitler ordered the invasion of Norway. Having swept across Europe at a terrifying pace, the Nazi assault on Scandinavia was designed to secure the valuable source of iron ore being delivered by rail from Sweden to the Norwegian port of Narvik. To complete the task, Hitler sent ten large, modern destroyers, with 220 Alpine Troops on each. Five smaller British H Class destroyers were sent up the fjord in retaliation by the Allied forces, with little knowledge of what to expect. On April 10, the first battle of Narvik began. Royal Naval Captain, Bernard Warburton-Lee, led his flotilla at midnight into the fjord. They had to navigate the four hour passage undetected, under darkness and in driving snow storms. The harbour — eerily silent on their arrival — quickly erupted into a torpedo attack. Back into the fjord, the destroyers Hardy, Hunter, Hotspur, Havock and Hostile were confronted by five German destroyers, coming from both the front and rear. This resulted in a ferocious sea battle with the loss of Hardy and Hunter and damage to the enemy ships. Those crew members who managed to abandon ship and swim ashore, under bombardment from the Germans, had to endure a ten mile march and pray for safe passage back to Britain in order to survive. Author Ron Cope delivers a comprehensive and gripping account of the Narvik battle, juxtaposing the myriad strategic difficulties encountered by the British Navy, with the vivid and insightful personal accounts of the brave survivors involved, most of whom were under the age of twenty-three. Including first-hand testimony from Cope's own father Cyril, a then twenty-one year old Torpedoman, and documents shared for the first time by the family of Captain Warburton-Lee, Cope presents an arresting account of this crucial British naval victory, as told by the sailors who were there. 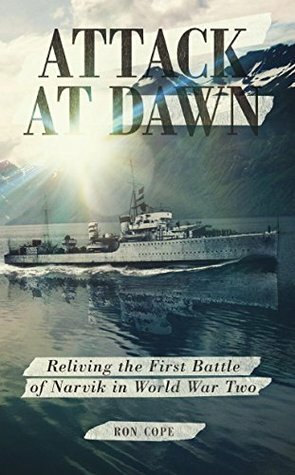 "Meticulously researched, Attack at Dawn relates the vivid real-life experiences of the British sailors who took part in the extraordinarily bold attack by five British destroyers against superior German forces at Narvik... and the desperate running battle that ensued as they tried to make their escape". John Warburton-Lee, grandson of Captain Bernard Warburton-Lee. V.C. 1. Why did you decide to self-publish the book? My aim was to have the book published by the 75th Anniversary (10th April 2015). I was advised to send my manuscript to the well known military book publisher 'Pen and Sword'. They took six weeks to get back. The Editing Commissioner was Brigadier Henry Wilson, he was very helpful, his words were, “Ron I hate having to turn down books like this”. But he went out of his way to offer professional advice. I was about to send it to my second publisher option but they came back with the same, “We will let you know in six weeks time”. I can quite understand the pressures that are now place on the old publishing firms, with the new technologies like digital books. They are running a business and need to be assured that any book when published must make a reasonable profit. As Henry says, “There is not a lot of money made here”. I was running out of time so I decided to go down the self publishing route. Initially, I went to possibly the largest and world wide company 'Pearson'. They were obviously a very professional set up, but whilst they made contact quickly and made promises, I was concerned I would be working with a commissioning editor in Philippines. She was extremely nice and knowledgeable but I want somebody nearer home. In the end 'Authoright' also offered a speedy process. They kept to their word and the book was ready within three months, two weeks before the Anniversary. In fact, what seemed like only days co-founder Hayley suggested a slight change from my previous 'working title' with the present result. Then the excellent 'Design Team' came up with the front cover options, one of which was quickly sanctioned. 2. How have you found the overall experience of self-publishing? The simple answer is yes. I wanted to be some part of the professional team and was willing to do my bit, being at home throughout and ready to go. So the advice is; let the team get on with what they know best and take on board their guidance. 3. Would you do anything different in hindsight? Nothing comes immediately to mind. I am a newcomer to this industry. 4. What do you take from the experience now that 6-years of work is finally complete? Once you have finished your book and decided to go down the 'Self Publishing' route, yes, an immense amount of responsibility has been taken away. It has been hard work keeping focussed and disciplined but it is not yet over, until you have the final product in your hands. However when that occurs it is the one of the best feelings you will ever experience in your life time. 5. What was your must-have writing companion/habit? I found I had to keep my brain functioning in top notch and needed to get plenty of exercise and fresh air. In my case after forty years I was still playing squash two to three days a week and on the other days spend an hour in the gym. Or as my wife Alison calls it “going round and round the hamster wheel”. Once I have done my sporting bit I feel much less guilty to partake in my poison, which is a pint or two of a cold lager and lime. During which I am able to put in another couple of hours work in the evening. Then I am able to convince myself I deserve a glass of wine with my meal, maybe followed by a brandy. In the early days I found it difficult to stop treading the keyboard until a piece of work still in my mind was completed. I now discipline myself and stop and leave till the next morning.